If you’re a golfer visiting Sydney, this guide provides a snapshot of the world-class golf courses at your fingertips, along with the nearest Meriton Serviced Apartments to make your stay complete. Meriton Serviced Apartments, Parramatta – situated in George Street on the banks of the Parramatta River, within easy walking distance of Parramatta CBD. These 202 luxury oversized apartments provide all the comforts of home plus all the facilities of a five-star hotel, including indoor pool, spa, sauna and gym. Boasting a modern contemporary new look after a multi-million dollar refurbishment, Meriton Serviced Apartments are the ideal place to stay and play in Parramatta. . .
Parramatta Golf Club – in Park Parade, less than a kilometre from Parramatta CBD, this is the ideal destination for a quick 9 holes any day between 6am and 5pm. It is a par 31, 9-hole public course of 1,897 metres and despite being short, it is quite challenging, with the lowest recorded score in any Pro Am event being 28. An ideal course if you’re in Parramatta on business and enjoy having a swing in your down-time. Meriton Serviced Apartments Waterloo – situated in Danks Street, just minutes from the heart of Sydney, these 184 self-contained luxury apartments are nestled in the leafy surrounds of Crown Square. Everything is close by to these fully-equipped apartments, including the Sydney Cricket Ground, Sydney Football Stadium, Randwick Racecourse and of course, Moore Park Golf Course. Moore Park Golf Course – located in Cleveland Street, Moore Park, this is one of Sydney’s oldest and most centrally located public golf courses. It is a challenging par 70, 18-hole championship course of 5,791 metres and offers an enjoyable round for golfers of all abilities. Moore Park Golf Club has a range of facilities, including a huge 60-bay all-weather driving range, putting and chipping practice greens and an historic club house with bistro and patio bar. Great golf and a great day out is assured. Meriton Serviced Apartments, Zetland – in Defries Avenue, Zetland, these 334 furnished apartments are the perfect place to base yourself on a visit to Sydney. With their own balconies and kitchen and laundry facilities, they offer luxury accommodation right in the heart of everything. And if you’re a golfer, they’re the perfect choice, because close by are two of Sydney’s finest courses; Eastlake Golf Course and the Australian Golf Club. Eastlake Golf Course – situated in Gardeners Road, Kingsford, Eastlake is a sand-belt course that is highly rated for golfers of all levels. It is a par 72, 18-hole course of 5,881 metres, set amongst the Botany Wetlands on two narrow strips of land. It is a challenging course that regularly hosts qualifying events for the NSW and Australian Open Championships and, unlike the nearby Lakes and Bonnie Doon courses, it is a public course where anybody can play. The Australian Golf Club – located in Bannerman Crescent, Rosebery, this is Australia’s oldest and Sydney’s most prestigious golf club and has hosted many Australian Opens over the years. 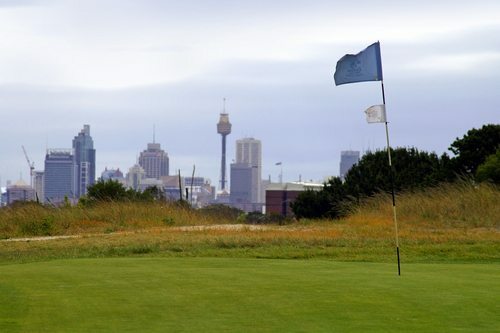 If you’re visiting Sydney and are invited by a member to play there, don’t miss the opportunity (members of reciprocal clubs can also be invited to play). The picturesque course was re-designed by Jack Nicklaus in 1977, thanks to a donation from the late Kerry Packer and the layout features many undulations and water hazards, winding through eucalypts, conifers and paper barks. Meriton Serviced Apartments, Bondi – in Grafton Street, Bondi Junction, these 182 self-contained apartments are fully appointed with their own kitchen and laundry and facilities within the complex include resort style swimming pool, spa, sauna, gym and tennis courts. Westfield, one of Sydney’s largest shopping centres, is right next door and beautiful Bondi Beach is just down the road. Also in close proximity are a number of excellent Sydney golf courses. Bondi Golf Club – in Military Road, North Bondi, this is an old style 9-hole public golf course with one par 4 hole and 8 par 3s. Unlike some of the prettier meadow-style layouts around Sydney, Bondi is a challenging course, even for the pros, who use it to warm up for the Royal Sydney and it has a record of 4 under par. While it is a challenging course, it is also a picturesque one, with ocean breezes and great views of the coast and Bondi Beach and playing here is an enjoyable outing, as long as you aren’t trying to beat any records. Woollahra Golf Club – located in O’Sullivan Road, Rose Bay, this is another great public course where you can play a leisurely 9 holes in beautiful surroundings. The greens and fairways are extremely well maintained and this beautiful little parkland course is rated easy to moderate, so it’s perfect for golfers at any level. Royal Sydney Golf Club – located in Kent Road, Rose Bay, this is one of Australia’s foremost sporting and social clubs. A members-only club with a long waiting list to join, Royal Sydney offers an excellent range of facilities. These include a world-class 18-hole championship course, where the Australian Open is often played, a 9-hole centenary course and two practice areas. There are also 18 tennis courts, bowling greens, croquet lawns, a squash court, a fitness centre and an historic club house complete with restaurants, bars and even accommodation. It’s an impressive and historic Sydney landmark and if you are lucky enough to be invited to play there, be sure to bring your wallet.